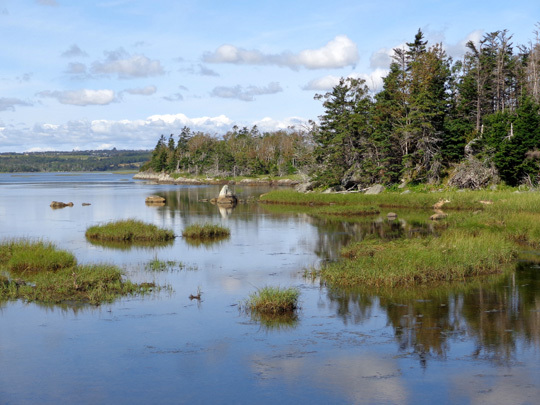 for walking, biking, cross-country skiing, fishing, and kayaking"
We initially chose Halifax as one of our "home bases" to explore Nova Scotia because of the numerous historical and scenic attractions in and near the city. Then Jim got busy searching online for good places to hike and cycle. 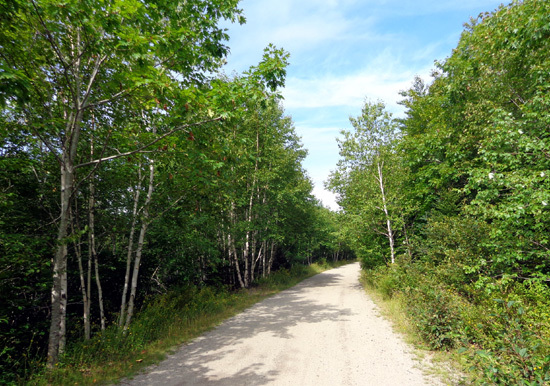 He discovered a good network of rail trails in the area, some of which are part of the extensive-but-not-totally-connected Trans-Canada Trail that stretches from British Columbia to the Maritime provinces. How's that for a great trail??? 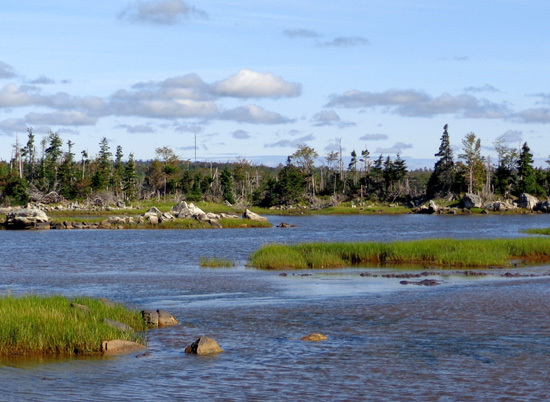 Salt Marsh and Atlantic View are our favorites in the Halifax area. 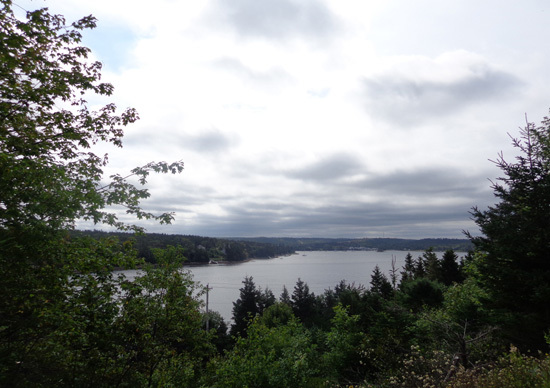 This entry includes photos and information about bike rides we did on the five trails listed in the heading above, on three different days this week. 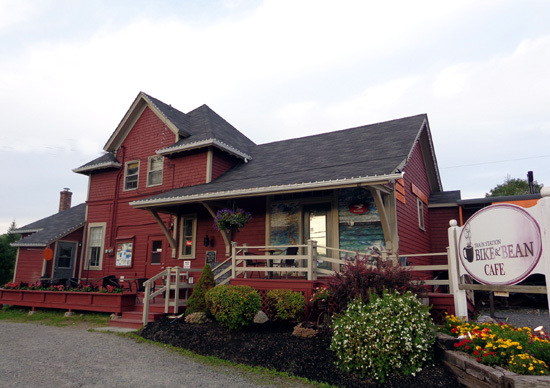 On Sunday we took Casey with us to the Bike & Bean Cafe on NS 3 about seven miles west of our campground. 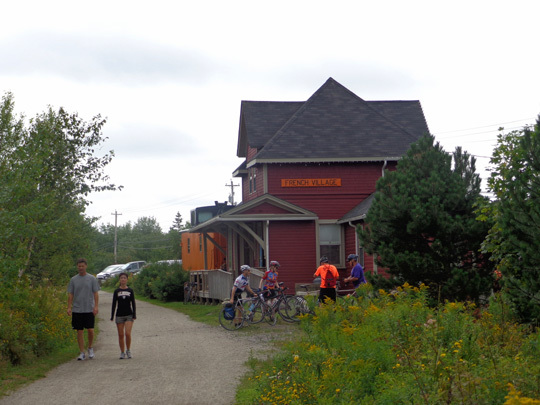 It's a bike shop and cafe in the former French Village train station, which was in use on the Halifax & Southwestern Railway from 1904 to the 1990s. The temperature was still in the 50s F. and overcast so Casey did fine in the truck while we rode our bikes. 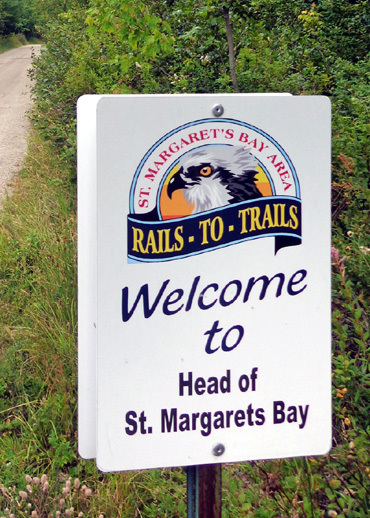 The St. Margaret's Bay section of rail trail is about 30 km long, stretching NW of Halifax and SW toward St. Margaret's Bay. 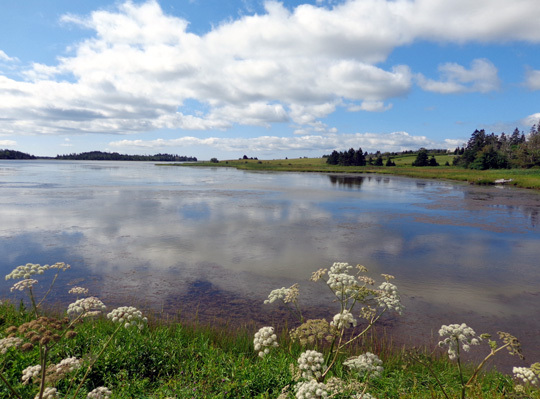 It connects with other shared-use trails in the metro area and south shore. 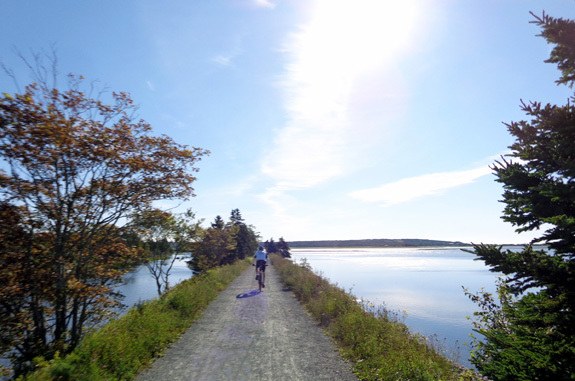 The surface isn't as nice as the Celtic Shores Coastal rail trail that we rode on Cape Breton Island last week or the other four trails in this entry but it's still easy to ride -- a few ruts and gravel in some places instead of smooth crushed rock the whole way. I rode 5.25 miles SW and Jim went about 7 miles that direction before turning around. I had a total of 10.5 miles riding when I got back to the truck. 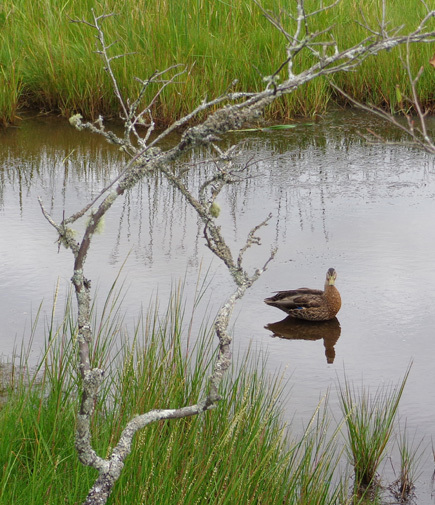 We threw sticks to her in the water, then went back to the truck and home. I walked a total of 1.5 miles with her on the rail trail. Jim ended up with a total of about 26 miles on his bike. 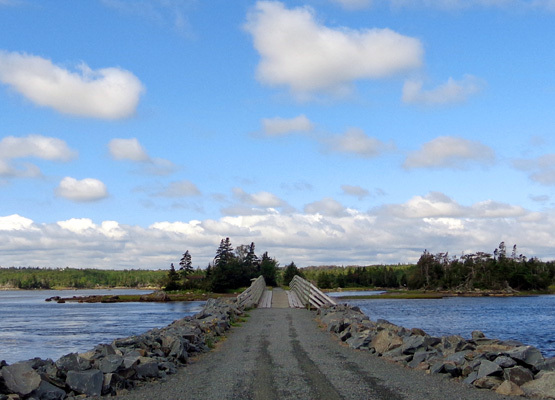 The bike path lies about 150 feet above the water, between NS 3 and 103. The best water views besides the ones above are half a mile along the reservoir where Casey swam. The rest of the trail we saw is mostly a green tunnel of trees -- various conifers and hardwoods. That's nice' but when water is nearby it's even better to be able to see it. The parking area around the cafe was packed with vehicles that Sunday morning. 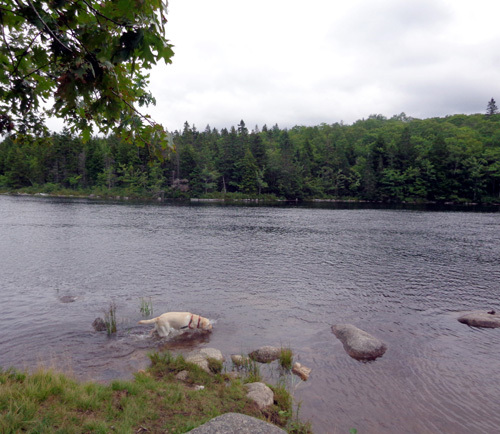 We expected to see more people and dogs on the trail than we did. They must have been strung out along the 18+ mile trail. Most people I saw were cycling; a few were walking. Two ATVs went by when I was walking Casey. 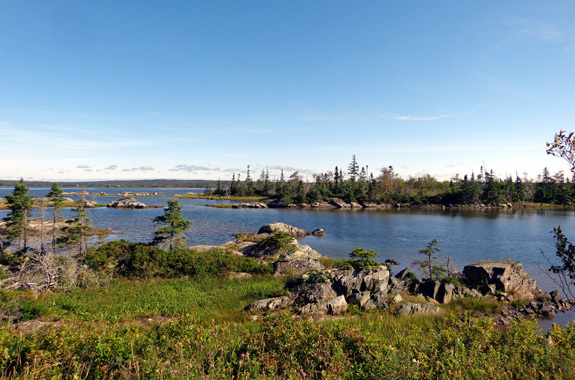 Trails like these are also popular with cross-country skiers in the winter. 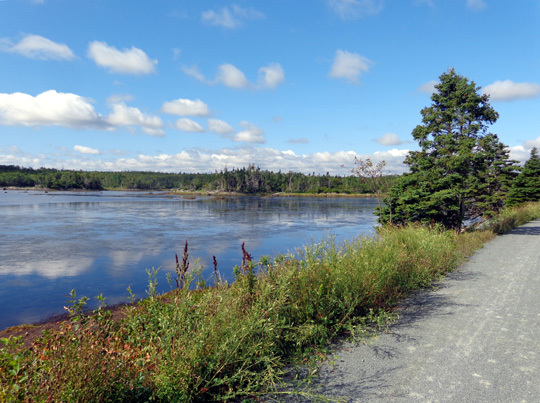 These two popular rail trails connect and are part of the vast Trans-Canada Trail northeast of Halifax. 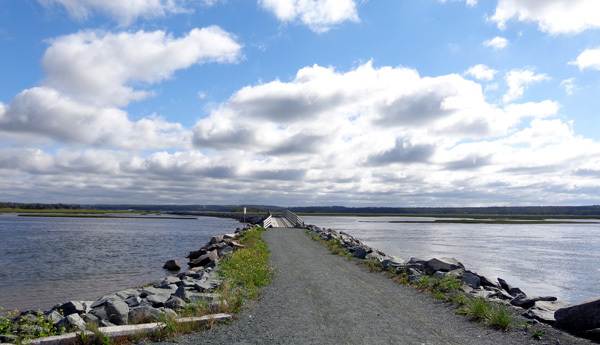 Built on the bed of a former railway, they lie within the Cole Harbour Coastal Provincial Park. 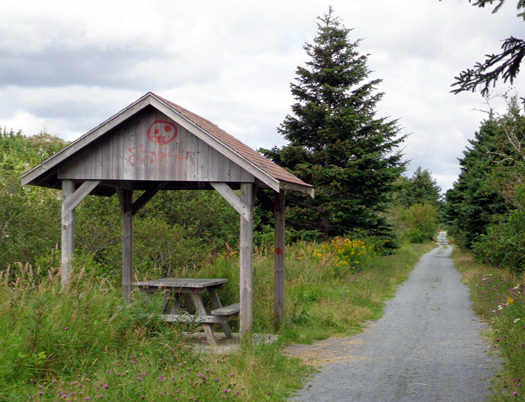 Two other trail segments we rode, Heritage and Shearwater Flyer, connect at the Salt Marsh trailhead on Bissett Road where we parked. I'll show photos of those later in this entry. 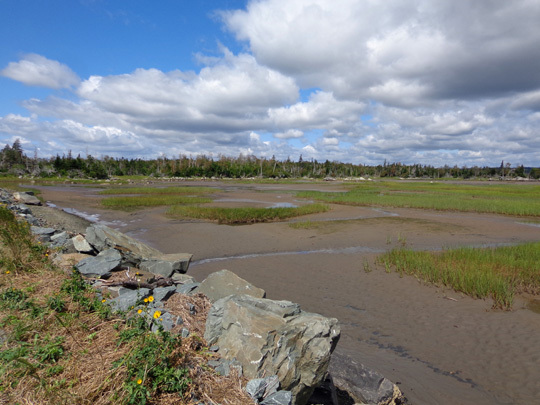 # 1 = the Salt Marsh Trail, which goes across a lot of water on land dykes and wooden bridges. 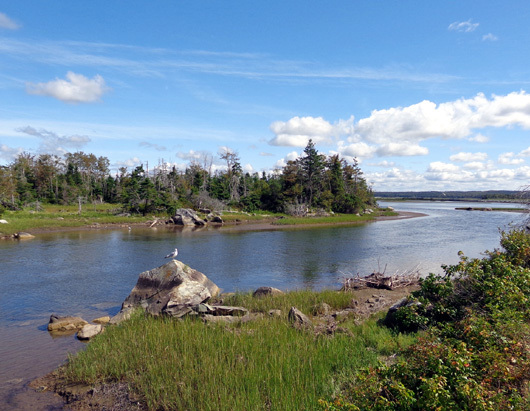 # 2 = the first half of the Atlantic View Trail. 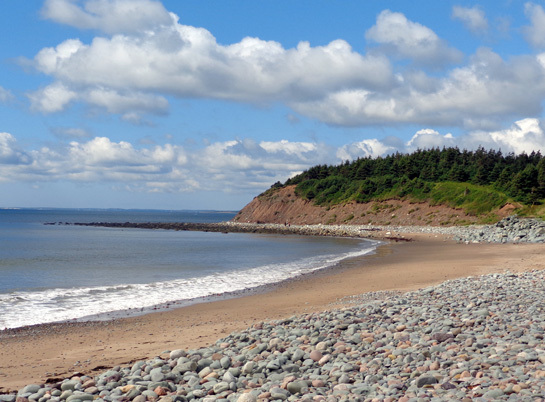 It continues farther along the coast than shown here. 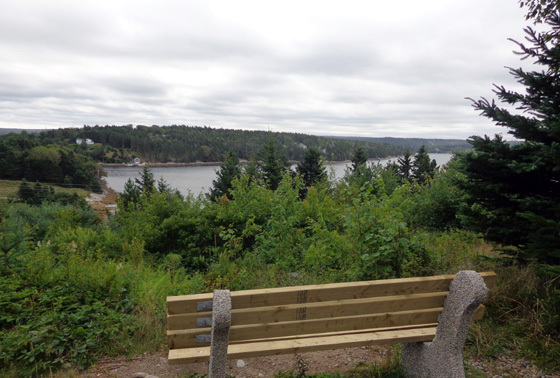 # 3 = the Shearwater Flyer Trail; Halifax Harbour is to the left of Shearwater. 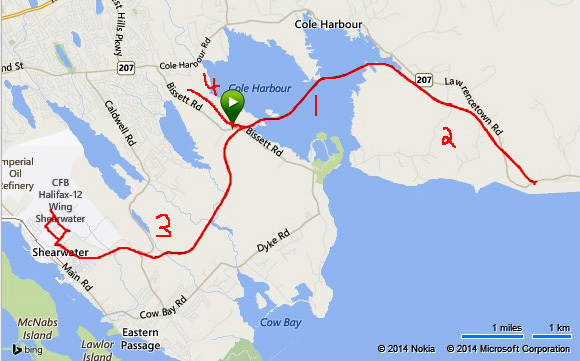 # 4 = the Heritage Trail. 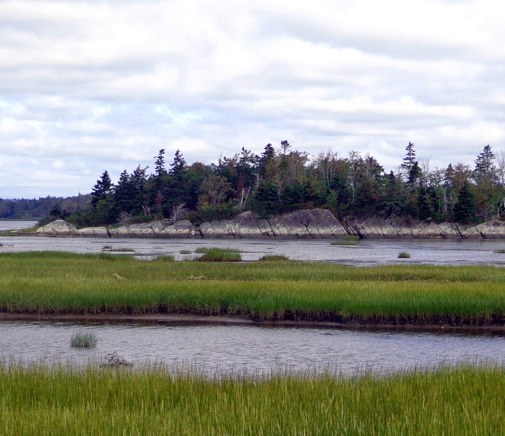 I took more photos where there were scenic water views than through less interesting green segments so most of the photos in this entry on the Atlantic View section show water. Note that I've only seen 2.2 miles on the western side of this 6.2-mile segment. Jim did 4+ miles of it but he didn't take any pictures. We liked these segments so much that we rode them two different days this week. 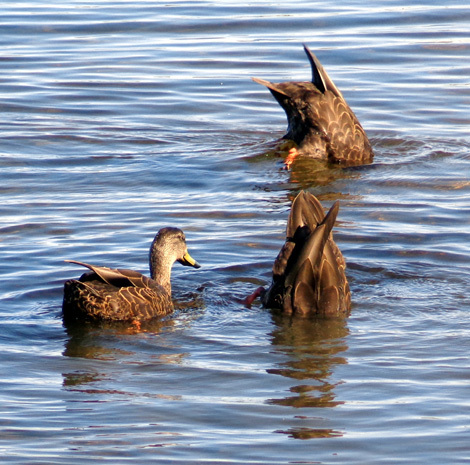 That was interesting because we got to see them at various stages of the tides. 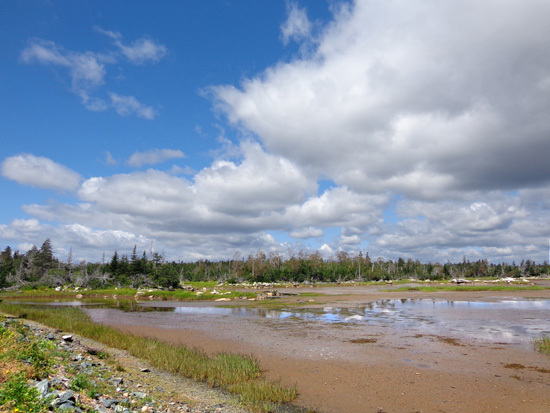 On this side of Nova Scotia's peninsula -- the eastern, Atlantic side -- the tides are nowhere near as variable as they are on the western side in the Bay of Fundy. 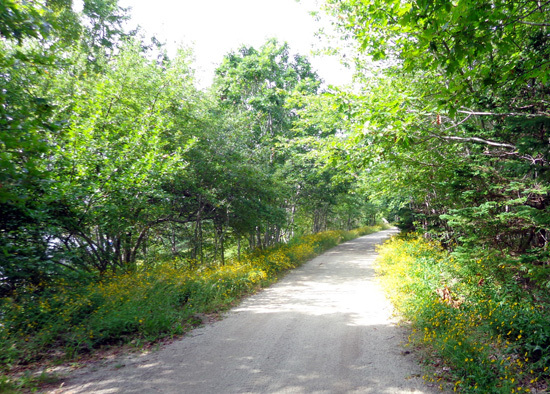 Good thing, because these rail trails are not much above sea level. 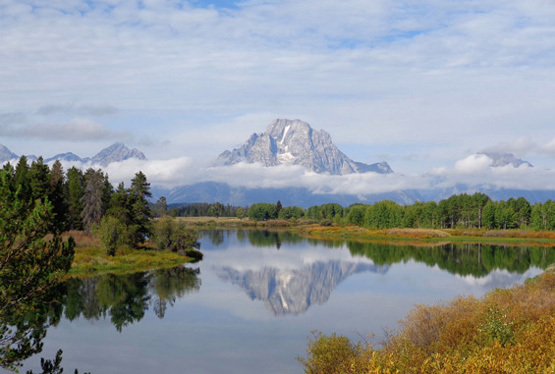 You can see that in many of the pictures in this entry. 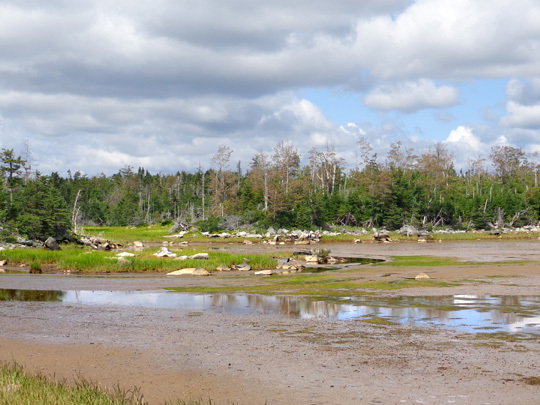 When the tide goes out, however, quite a bit of mud is exposed in the shallow basins on either side of the trail. 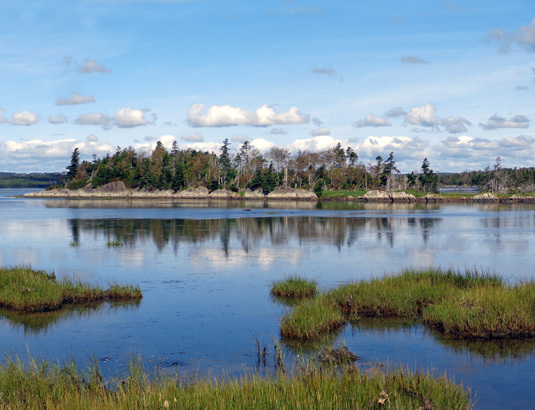 That's when the marsh really comes alive. 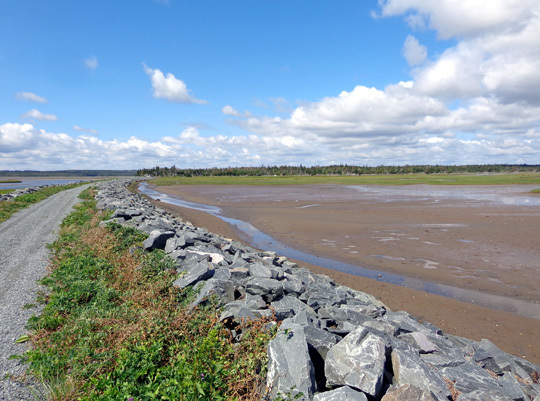 Although I loved the pretty blue water surrounding me when the tide was higher, I liked riding these two trails better at lower tide levels because more rocks, mud, and birds were visible then. A seagull is sitting on the large rock, possibly waiting for its next meal. 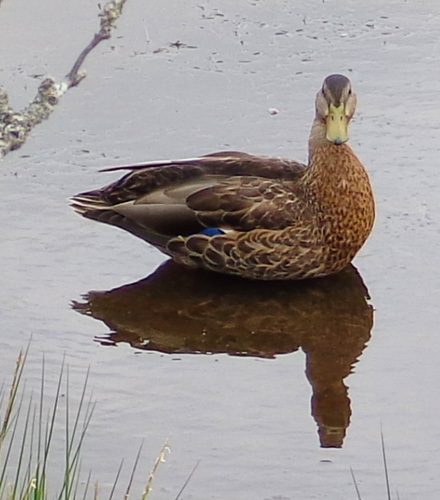 Mama and two juvenile chicks were feeding several feet to the left.